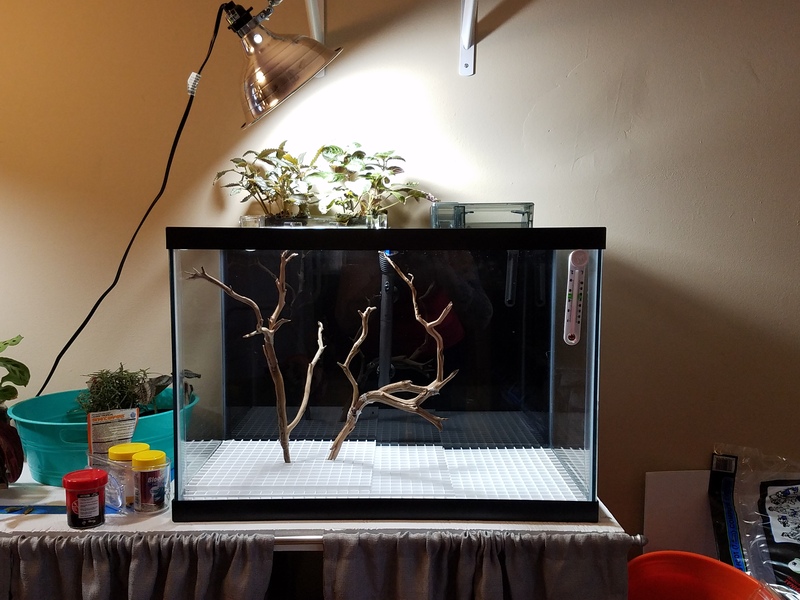 So I bought this tank back in October but things happened and I wasn't able to get to it until after the first of the year. 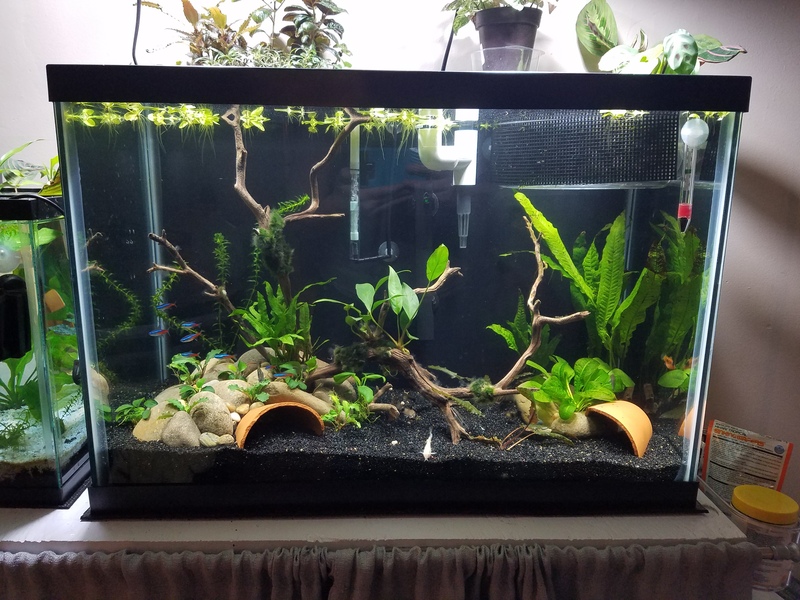 It's only my second for realsies planted tank so I've been very diligent with how I go about it. 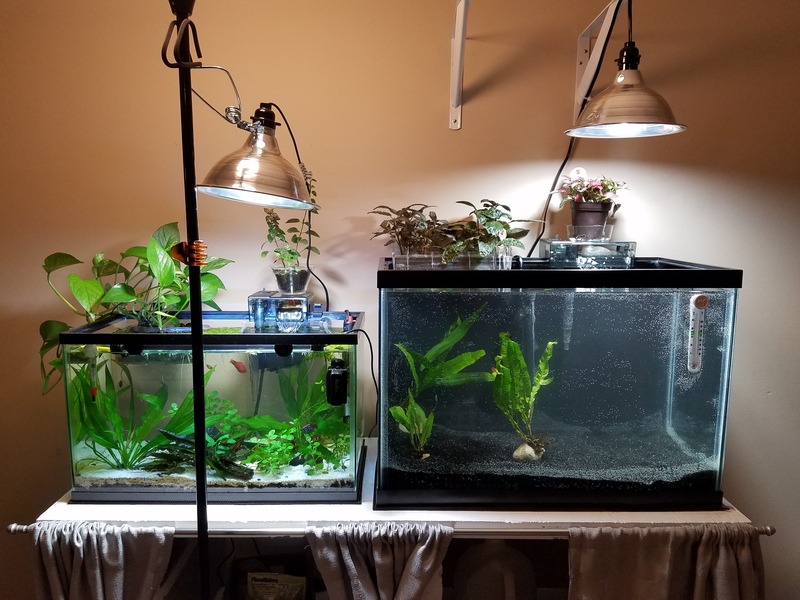 The plan is to keep it as low tech and low maintenance as possible. I'm also on a budget so I've tried to go for options that have both form and function, but are also cost effective. It has most definitely been a labor of love. My boyfriend likes to call it an obsession but I think he's just jealous. I plan on going back through the whole build when I have the time but for now here it is in its current(ish) state. 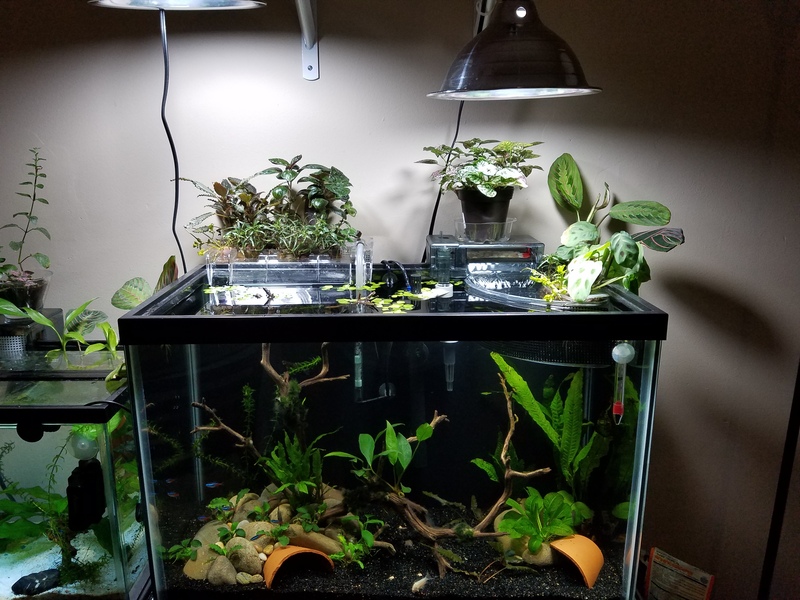 I'm still in the process of moving things around and I just got a new canister filter so that will really help open up more room for emergent plants. Ok...so I did go a little overboard on the live stock, but who doesn't?? That's it for now! Perhaps this weekend I can add some progress pictures. tredford and ReeferRob like this. 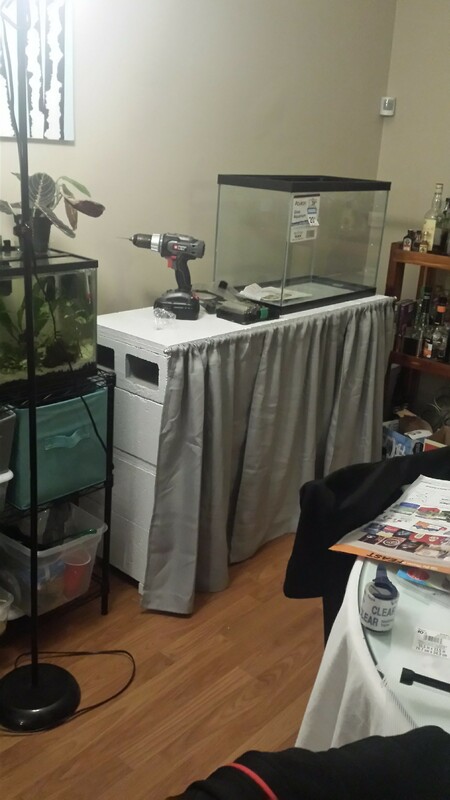 When I got this tank I was hoping I could find a piece of solid furniture at one of the thrift stores around me that would be big enough to fit both this tank and my 10 gallon tank. I couldn't find anything that I liked and just don't care for the look of the metal stands so I decided to make my own stand. I'm not an experienced woodworker and just flat out don't have the right tools to make precise enough cuts so I decided to go with the ply wood and cement block approach. 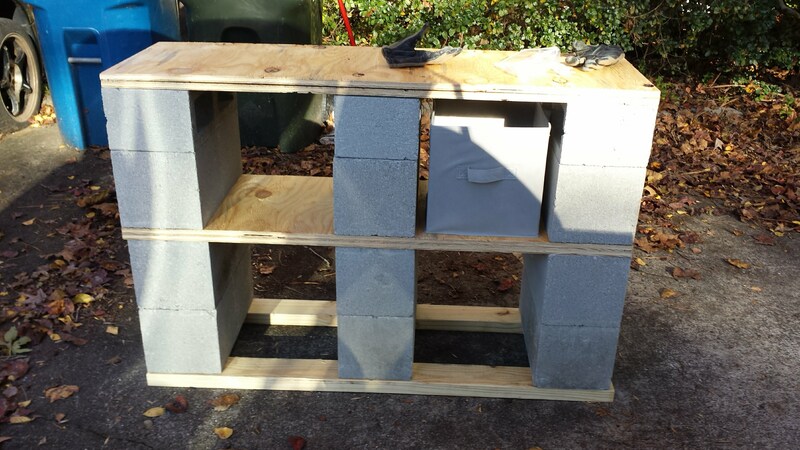 It's a little overkill and going to be a pain when we move, but it's customizable, sturdy, and relatively cheap. Home Depot did most of the cutting for me so that also helped. I doubled the ply wood and screwed it together for extra support. I decided to use wood on the bottom to keep it from scratching up the floor as much and to add a few extra inches. The spaces are the perfect size for those cheap storage bins and most of the small, plastic sterilite containers. I ended up painting everything so it would fit in a little better. I used a few coats of latex paint on all the wood to make sure the water doesn't cause any issues. To cover the front I bout a cheap curtain rod and a set of two curtains. I cut the curtains to length and used iron-on hemming tape to keep them from fraying. The bottoms that I cut off had a hem that could be opened and used as a pocket so I hemmed those for a total of 4 "custom" curtains to cover the front. I just used screw in hooks to hold the rod. 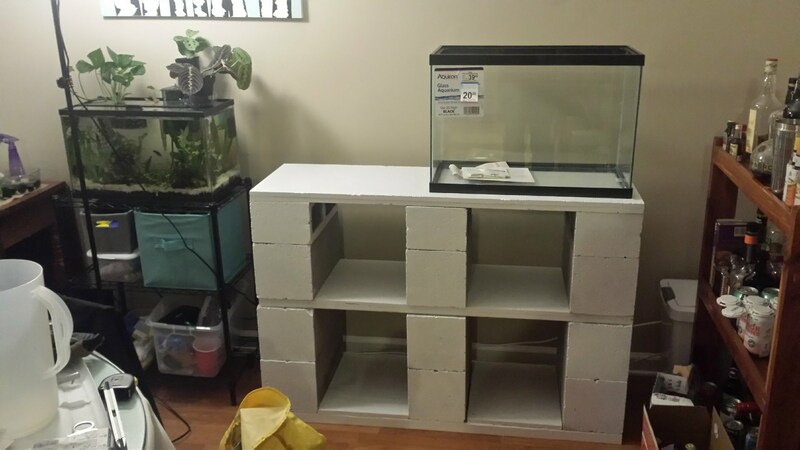 Once I got it all together it sat empty for a few months due to reasons. I was able to get back to setting everything In late January 2019. 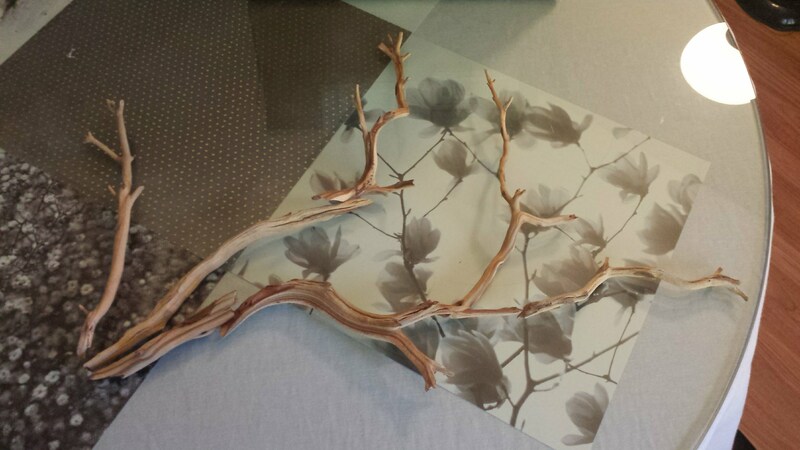 The driftwood I got was in small pieces, but had really great shapes so I decided to piece it together myself and use moss to cover the joins. Bump: I decided to go with an eggcrate bottom to help create a slop and help hold things in place since I had orginally planned to ziptie the driftwood to the eggcrate. Luckily there is a Tractor Supply about 30 minutes from me so I picked up some BDBS and put down some too much osmocote plus. Since the surface of the wood isn't completely flat and I didn't want to fill and sand down everything by hand I just cut a black yoga mat and put both tanks on that. I also decided just to go with shop lights and shelf brackets for the lighting. I like the look of the lights and it was way cheaper than most other lighting options. Thanks @KayakJimW! I got the idea from @hitmanx's The Celestial Swamp build. I added a second one just yesterday. To cut back on hoses and equipment I covered the outflow of the first box and connected the second box with a bulkhead through the side. I'm hoping to get those pictures up soon too.